UPDATE: This article has been Under Construction for a few years now and has been rendered obsolete by better tech and tutorials that are more in depth and more clear than this. I will keep this page up forhistorical reference, and urge everyone to seek out a better tutorial. First things first, the items you’ll be needing. Everything you used for the LCD mod (security screwdriver, etc) plus a rotary tool of some kind, such as a Dremel. Note: The plugs available with this charge may be too big to fit the Nomad’s power plug, so you may have to nab an extra Genesis power brick and switch the plugs around. 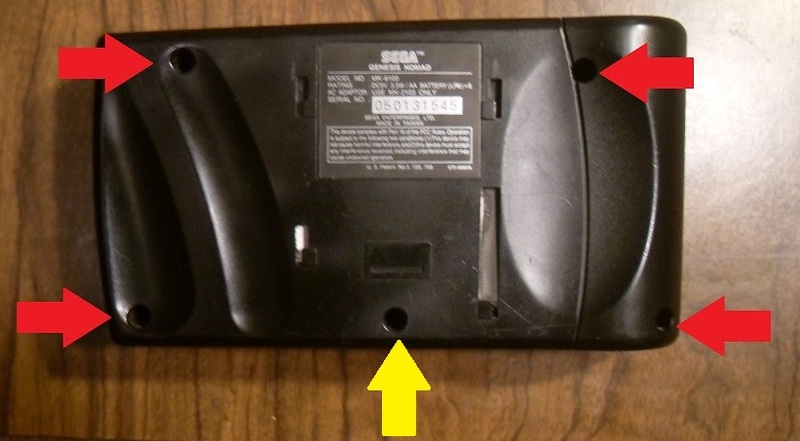 First, remove the screws just as you did during the LCD Mod in Part 1. 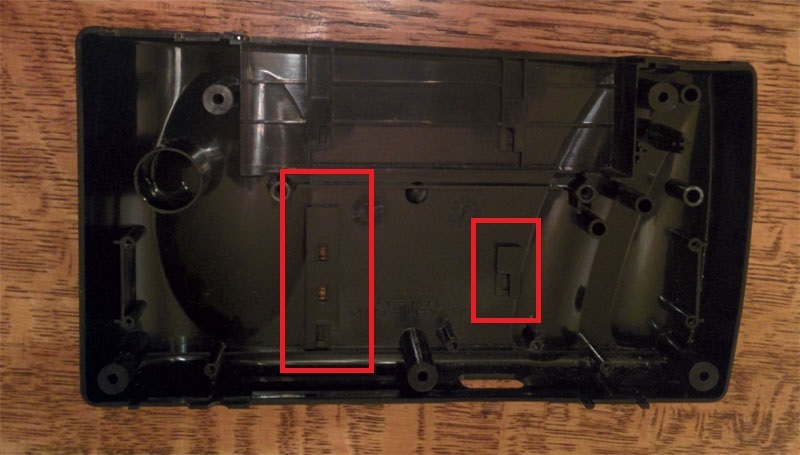 The four Phillips screws are on the outside, and don’t forget about the security screw in the middle. Again, if you don’t have a security screwdriver, its best to remove it once with the (link: pen trick picture) from the (link NES 2 A/V mod) post and omit or replace it with a regular screw. 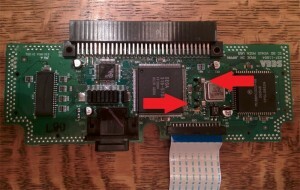 The next thing is to disconnect that ribbon cable to separate the case halves. Just carefully pull the tabs out of each side then the cable will just slide out, again just like in part 1 (don’t worry, new stuff incoming). Now, with the two case halves and motherboards separated, we’re working in the back of the unit this time so you’ll want to remove that back board from it’s shell. All Phillips screws this time around, with ten in total. Pay no mind for now at the electrical tapes and extra wires as this picture was taken from a completed unit. They are not important now but something to expect later. Make sure to disconnect all the connectors from the minor daughterboards so you can completely remove the motherboard from the case. Now that all these things are disconnected and unscrewed, it’s time to pull it out. Be wary of the Player 2 plug! You’ll have to carefully hold out the corner of the nomad case to get the board to come out peacefully. Just pull the lip of the case out while pushing in and up on the plug itself. Not too harrowing to remove, just something to be aware of. Now that we have the board removed to freely work on it, let’s take a look at the backside of the board. See those two metal prongs? 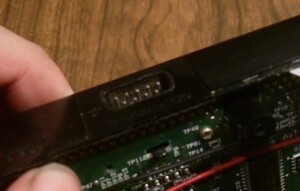 Those are the connectors for the external battery pack. We won’t be needing those anymore so you can either desolder them, or simply chop them off. Just make sure that it’s flat where they used to be after you remove them. Once the prongs are removed, we can return to the case and reshape some of it’s plastic innards to ensure that everything will fit correctly later. 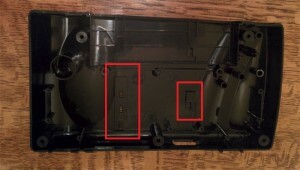 Using your rotary tool, remove the two points where the battery pack slides into and smooth them down. A Before & After shot here. As far as dealing with the somewhat large rectangular holes that are left after removing dremeling them away, you can leaving the holes empty, or you can fill them in with whatever media of your choice. I just cut a small piece of plastic to fit, painted it black and glued it in place. We have the batteries wired up in series (double voltage, same capacity), and soldered to the Protection PCB at the key points. 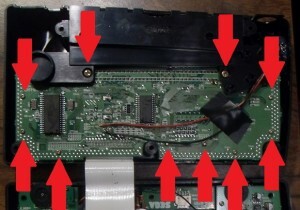 Fortunately the PCB has a nice and simple diagram on how to wire it up. 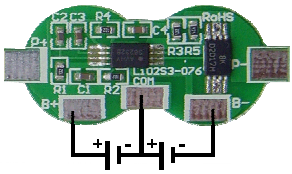 The negative lead of the first battery goes to the B- connection, then the positive lead of the first battery connections goes to the COM connection of the PCB, as does the negative lead of the second battery. 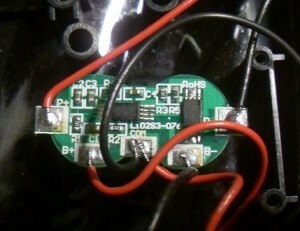 Lastly, the positive lead of the second battery goes to the B+ on the PCB. 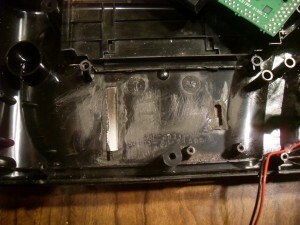 It is also imperative to make sure you keep the wire leads on the batteries covered up. We don’t want to risk anything getting crossed, resulting in shorts, or worse. 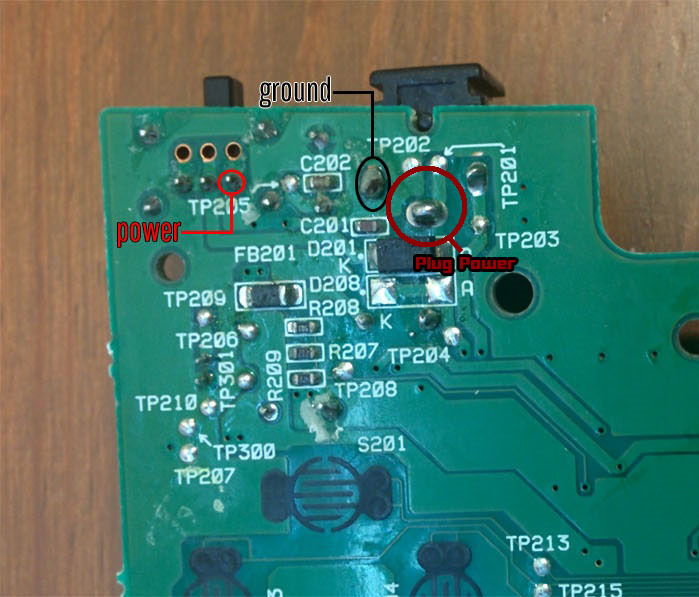 The positive and negative nodes (P+ and P-) of the PCB are for both charging and discharging (and will be attached to the motherboard). Ok, so your battery pack is attached to the protection PCB. Now’s the time to make sure it fits! 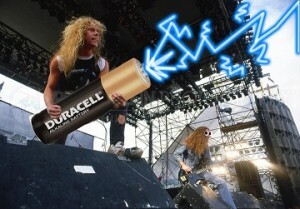 Your batteries should fit something like this. OK, so your batteries now fit….you have one final tweak to the system to perform. You see that area were the power plug is attached on the front board? It has multiple traces coming from its parts. OK, this might be a little difficult. 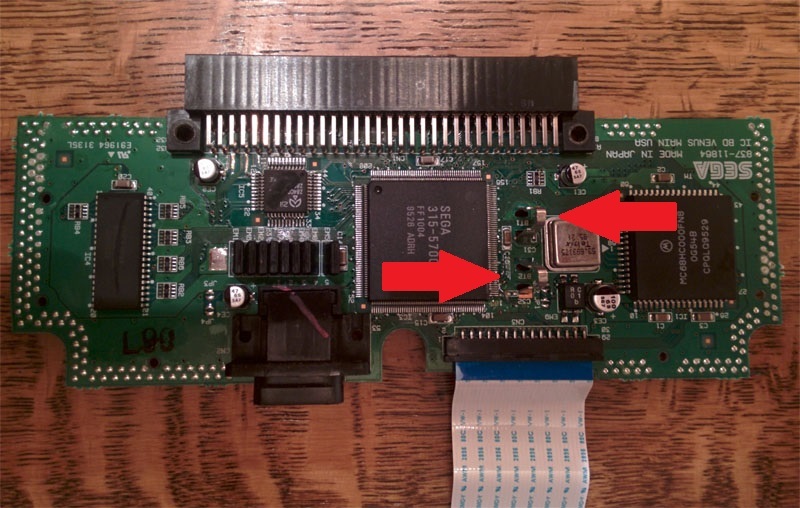 You’re going to want to desolder the MAIN ground connection of the plug. Once desolderd, very carefully sever any possibility of that connection re attaching to ground in any way. 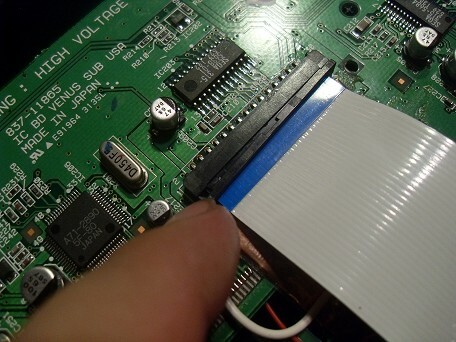 You can do this by either cutting around the solder base with a knife until the original solder point is no longer attached, or you can pull the lead up through the board and cut the lead down. Either way, it’ll be a pain. The ground wire in this pic is the one you wanna cut!Once that is done, it’s time to wire it up! Be sure to keep all the wires that aren’t hooked to power sources below everything in that case back. Also make sure that your wires that attach to the main board are clear of any of those posts as well. 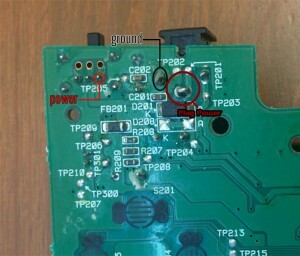 Hook your negative lead to the ground of the plug–that lead you just severed from the board, and the positive lead of the battery to the positive lead of the plug (see above). Once everything is in place, just reassemble it and congrats! 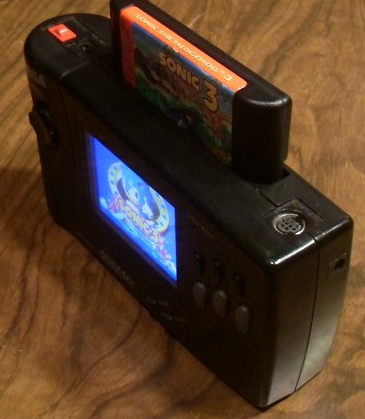 You now have a fully functional Sega Nomad that no longer needs a wall wart or tumorous growth on its back to rock some serious Sega Genesis action on the go! The battery pack supplies 7.4v and a nominal 1500 mAh of juice. So with the Nomad LCD mod, you can comfortably expect around 3-4 hours of battery life. It may not sound like much, I but I’ve found it to be more than sufficient for my on-the-go genny needs. NOTE! Just so you know, the low battery indicator won’t work at all with the way this mod is wired. Of course, if you really want that low battery light, you could simply sever the trace on the positive terminal of the power plug. Then send 2 wires out from the battery. One going to the positive end of the power plug, and one going to the positive connection of the original battery connection.